2017 is an important year for democracy, rule of law, and integration. The parliamentary elections are scheduled to take place on June 18th. In the 2013 and 2015 elections, AIS, with donors support, implemented Za’Lart Project – Raise Your Voice, Make Elections Count . Citizens reported through photos and videos: persons with criminal records participating in candidates’ electoral staff, vote-buying, misuse of the public sector, etc. The ad hoc teams verified some of the reports in the field. Only 90 days before the official opening of the 2017 electoral campaign, the Za’Lart team finds that no donors seems to offer any support for programs on democratic culture and free elections, having made no calls to finance programs with electoral components. Facing such difficulty, Za’Lart team invites donors, embassies, and organizations to support the country in its efforts for establishing democratic standards and a democratic culture, by reconsidering the importance of Civic Monitoring of Elections, and to support our Za’Lart 2017 Program. We welcome communication through lajmerime@zalart.al or through any other AIS contacts. 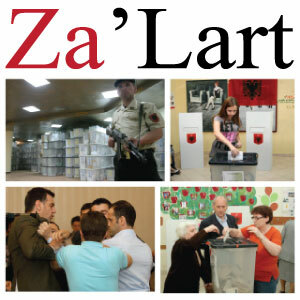 Six elections have taken place in Albania over the last ten years, including local and national elections. During this decade, there have been 86 proceedings initiated for election-related crimes and contraventions, involving 137 persons. The Open Data Albania (ODA) portal published information about such proceedings by type of criminal offence, article, and years. The ODA Analysis emphasizes that a phenomenon of high risk like vote-buying, qualifies as a contravention, and not as a crime in the Criminal Code. This makes such phenomena to be subject of a very light sanction, namely from 6 months up to 2 years of deprivation of freedom. Other types of electoral crimes are punishable by up to 7 years of imprisonment. Article 328 “Giving Compensations and Promises” refers to offering or giving someone cash or in kind donations, making them promises for jobs or other favors in order for that person to vote in a certain way, or participate or not participate in voting. The average annual income of the High Court Judges is four times higher than their salaries as judges. This is the result given by the publications made under the Money and Power section about the annual incomes of the seventeen judges of the High Court. Such analysis contains also a ranking of the judges by their total incomes, identifying their income from their work as judges, academic commitments, rent, bank interests, financial instruments, and incomes from their family members. According to judges’ self-declarations of 2015, a High Court judge makes an average of four times more money from other sources compared with their salaries. Such average is no higher than that of the MPs, whose annual incomes according to Open Data Albania analysis were 8.4 times higher than their salaries.